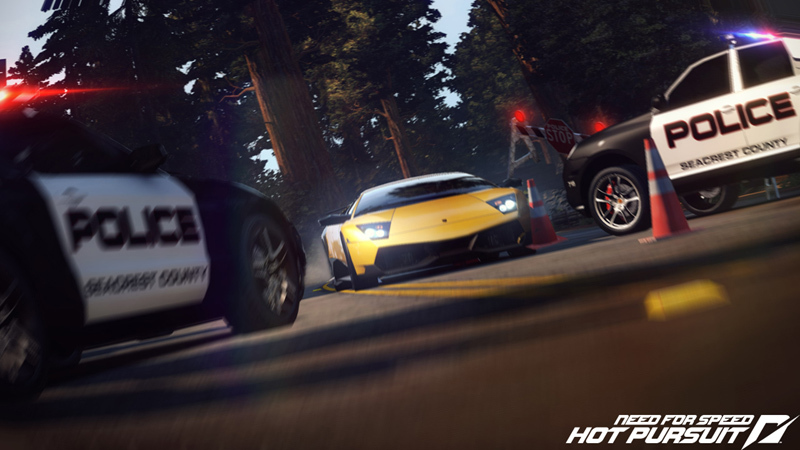 The console version of Need For Speed: Hot Pursuit blew us away last month. Despite the difficulty being a little bit “up there” in terms of vehicle AI, it’s still a lot of fun for those of you who like a quality Criterion Games racer. But what if you only have an iPad and not one of the higher-end game consoles? Well, you’re covered, thanks to a more-than-suitable handheld port for Apple’s device, in blazing high-definition. You are not so fast!!! Set-up is mostly similar to the regular versions of the game. You have a series of events broken up all over the city, between pursuit races with cop cars and regular races where you take control of the renegade driver. There are strategies involving both, as you not only have to put up with rival drivers that want to take the lead, but all sorts of traps that involve EMP’s, spike strips (which can easily cut your ride down to size) and road blocks. Some are more effective than others (mainly the road blocks, which you can cut through in the right spot), but overall these add some unpredictability to each race. We welcome these obtrusions with open arms. That said, the game isn’t quite perfect. Though there are plenty of races and cars to unlock (including some spiffy police cars), the content isn’t nearly as packed as the console version. You’ll probably discover everything in a week’s time, if that. However, single player is worth going back to mainly for the thrill of the chase, and the game also supports multiplayer via Wi-Fi and Bluetooth, which work remarkably well when it comes to racing against your buddies. Cop chases in particular are a hell of a lot of fun. As for the gameplay, EA has done a marvelous job recreating the experience for the iPad. You’ll mainly tilt your device to steer your vehicle as you go with auto-acceleration, but you can change the options around if you feel like controlling your own speed. The handbrake and nitro systems are very cool, as you draw on the screen to activate them while continuing to steer. One might think it’s troublesome, but it works easily, and you’ll be drifting like a pro by the second or third try. Also, the game looks stunning on the iPad. It’s about on the same level as EA’s previously released Shift, with highly-detailed cars that look great both on the road and in a wreck, and tracks that zoom by with visual splendor. And the frame rate doesn’t suffer that much at all, despite everything that’s happening on-screen. The music is jam-packed and exciting, and will keep you in the thrill of the hunt. 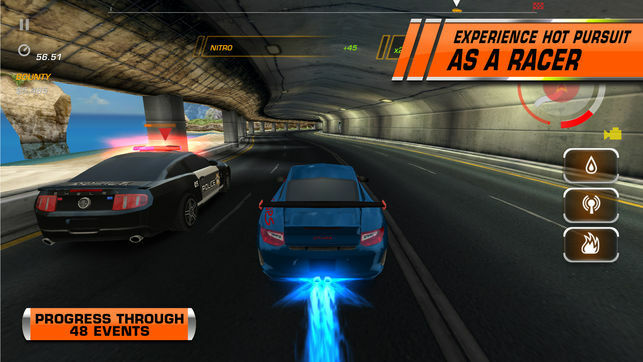 For $9.99, Need For Speed: Hot Pursuit on the iPad is a great deal. What’s more, EA is currently selling the game at a bargain basement price of just a dollar. Get it for this price ASAP, because nothing beats getting a quality ride for cheap. We know that the iPad has got a lot of great racing games to choose from (hell, we’re still trying to catch up on Firemint’s Real Racing 2), but Need For Speed: Hot Pursuit easily perches itself in that group. It’s fun, it’s thrilling and it’s a steal for its price. Step on it and download it.